If you’ve got 48 hours to explore Pune like a true Puneri local, here’s what you should do. Pune, particularly the Camp area, is full of cute little bakeries – most that date back to the colonial era. Grab a biscuit or mawa cake or chicken puff from any of our favourite old-school bakeries here. Kayani may be good, but our ultimate favourite is Khodayar Bakery near Golibar Maidan (read more on them here) that bakes the most divinely buttery batasis and Shrewsbury biscuits on pre-order. #LBBTip: If you’ve got a sweet tooth for chocolate and confectionery, don’t miss a trip to Cake N Counter or Kay’s Confectioners either. Clover Center in Camp is a cornucopia for affordable ethnic fashion, but they also have plenty of other interesting shops (and a secret liquor shop) which you can read about here. ‘The Place’ is Pune’s oldest sizzler joint – and if you’ve never eaten a sizzler in your life, this is exactly where you should try your first one. Read our recommendation, here. 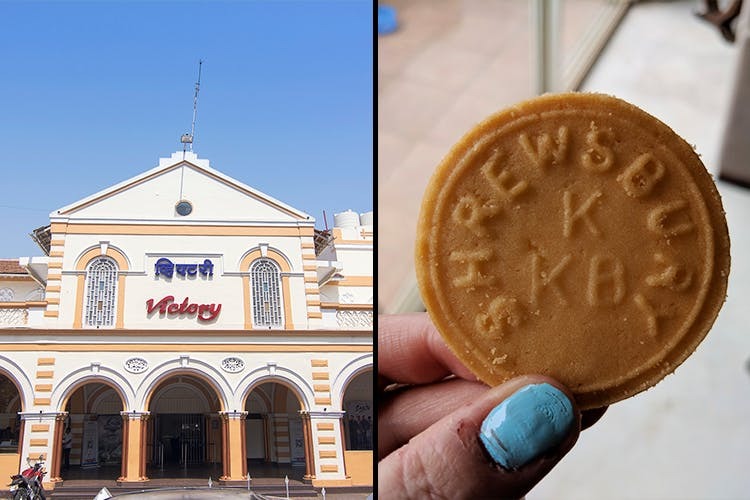 Located on East Street, Victory Theatre is one of Pune’s oldest remaining single-screen cinemas – and a charming place to enjoy a movie. Watch from the balcony seats, or sit in the stalls – just like the old days! Koregaon Park is popular for a lot of reasons, one of them being its thriving fashion scene and numerous boutiques. Here’s our recommendation for shopping these boutiques on a budget. #LBBTip: If you’re feeling picky, Lane 6 in Koregaon Park has some amazing street food we think you should check out, here. Just like Mumbai and other metro cities, Pune has its own community of Chinese eateries that have an almost cult-like following. Enjoy authentic Chinese and Indo-Chinese cuisine at any of these restaurants, via our guide to dining at them here. Dive into the old neighbourhood of Deccan Gymkhana, and explore its old-world charm, towering trees, and colonial-era bungalows. There’s a lot to discover here, from shopping to food – read about it here. We recommend eating at bistro Le Plaisir for lunch; read our recommendation here. Juna Bazaar may only happen on Wednesdays and Sundays, but it’s worth a visit at least once. Test your bargaining skills as you explore the makeshift stalls, which sell everything from antique jewellery boxes, to household tools, vintage records, and more. Read our guide to shopping at Juna Bazaar, here. Pune is a hub for craft beer, and we have at least seven popular home-grown breweries that you should read about, here. Though most restaurants and bars close early, here’s a handy guide to those of them that stay open after midnight. Want to know why we love our city so much? Read more, here. Pune’s got its own set of quirky museums you should check out, here as well as these 6 lesser-known historical sites here. And, if you’re a true blue food lover, then check out these 12 popular foods that Puneris are obsessed with, here.